Dedicated to marine conservation, The Watermen Project are a non-profit organisation lead by a team of highly skilled free divers to aid and support global shark research. Our team has been involved in multiple successful projects together including filming sequences for the IMAX production “Great White Shark 3D” and the tagging expedition of 2012 and 2014. 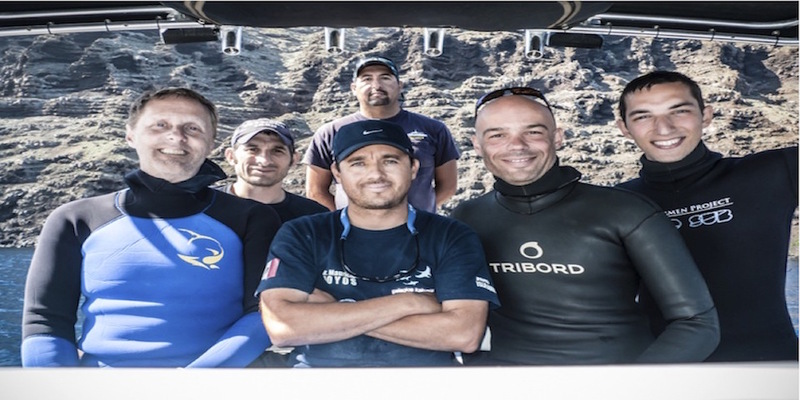 Lead by William Winram, Fred Buyle and Lukas Muller, the Waterman project work directly alongside Mauricio Hoyos to help and aide his ongoing study at Guadalupe. Our vessel as been used to as a platform for these studies and it is always a pleasure to help this fantastic and passionate organisation. During the Waterman projects’ 2012 expedition we aided in the filming for the movie “Great White shark 3D”. During the filming our team got Will and Fred up very close to one of the islands’ biggest female White sharks, the enormous 18ft “Mystery”. In the same year the team managed to tag 11 sharks (mostly larger females) during a 5 day expedition. Free diving with the sharks, the Waterman project use spear guns and acoustic tags. Once the sharks are tagged their location will be monitored by Mauricios’ underwater acoustic transmitters. The team where back in 2014, this time around staying on the island for a number of weeks with Mauricio and Dr Yannis Papastamatiou. During the expedition they managed to tag 15 sharks with acoustic tags and take biopsies from 7 different individuals. Conditions were difficult at times during this expedition as the island was experiencing the effects of El Nino and not so many of the larger females where around this particular season. They did however manage to tag 3 of the islands big girls “Emma”, “Gianna” and “Faye”. Working together to help such a dedicated, passionate and knowledgable team is always a pleasure and we look forward to many more collaborations together at the island for years to come.